Meinong in situated at the northeast side of Kaohsiung City, the north part of the Pingtung Plain in the shape a sitting frog. 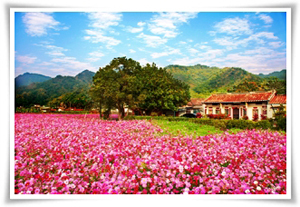 The township borders Liouguei at the east, Gaoshu of Pingtung County at southeast, Ligang (Pingtung County) at the south, Qishan at the west, and Shanlin at the north, stretching north-south to 15 kilometers and expanding east-west to 9 kilometers from, covering an area of 120.0316 square kilometers. Meinong is surrounding by mountains; the Meinong Mountain Range at the north side includes the peak-Yueguangshan, Rentoushan, Jinjimianshan, and Ciweishan. The east side is guarded by Jianshan, Chadingshan, Guishan, Daguishan, and Siaoguishan. Laonong Creek runs through the south side and Cisan township shares a border with Meinong at the west side. The township boasts 4,000 hectares of top-quality farmland, which nurtures the "Barn of Southern Taiwan" and the "Kingdom of Tobacco ".